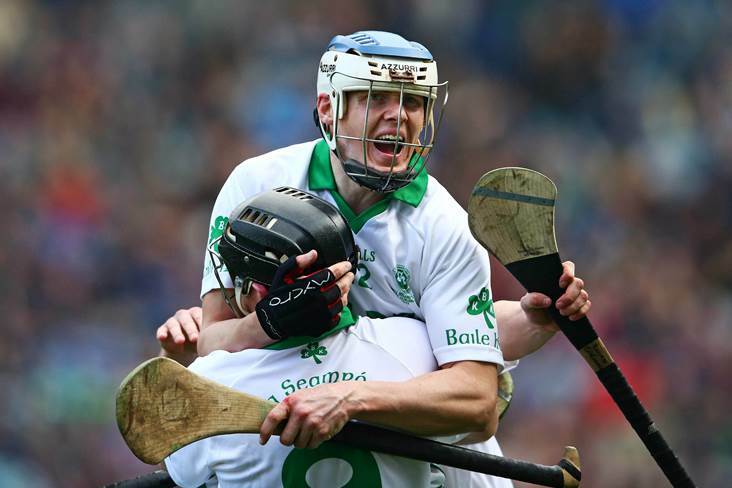 Ballyhale Shamrocks' TJ Reid and Bob Aylward celebrate. TJ Reid was in fine scoring form once again as Ballyhale Shamrocks made light of Michael Fennelly's dismissal to ease to a 1-24 to 0-13 victory over Erin's Own in the first round of the Kilkenny SHL this evening. Reid posted 0-15 in Kilkenny's Allianz League final win over Tipperary last Sunday and followed that up with 0-11 against the Castlecomer men as Henry Shefflin got his reign as Ballyhale manager off to the perfect start. Also in Group A, Bennettsbridge edged out Rower-Inistioge by 2-14 to 0-19, while last year's beaten finalists James Stephens crashed to a surprise 0-12 to 4-18 defeat to Mullinavat in Group B with Jamie Fennelly (two), John Walsh and Michael Malone scoring the 'Vat goals. In the same group, Ballyragget - who were involved in a stripper party scandal after their IHC success last year - began life in the senior ranks with an impressive 1-23 to 1-13 victory over Carrickshock.